The Hannya Playing Cards although simple in card back design has an artistic depth to them that draw me to this deck. With your $11.95 purchase you get 56 playing cards with some very awesome original artwork. The back design, as alluded to above, is very simple. It is a two-way design of a Japanese demon printed in reflective gold foil on a linen type black finish. There is a very thin gold line with wounded edges surrounding most of the playing card. The card has a thin white border and it looks very sleek. 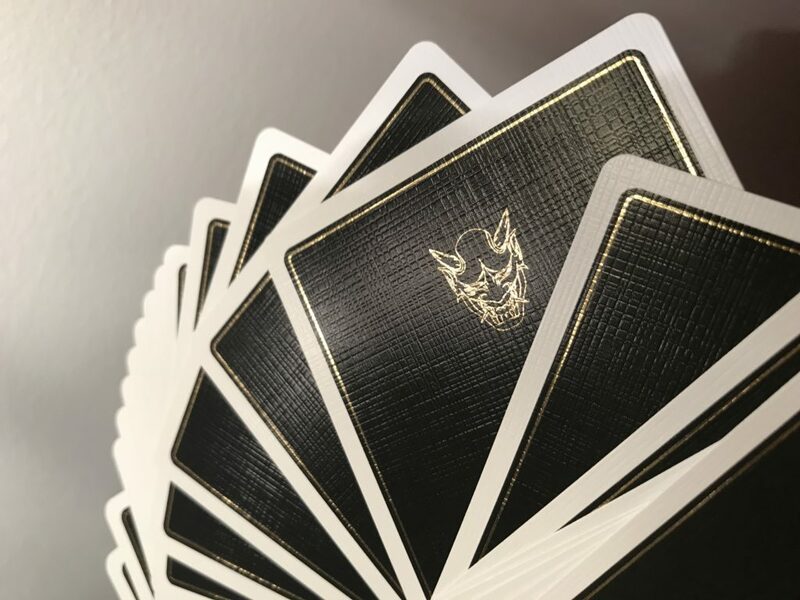 The tuck case is a matte black card board with the image of the demon in gold foil ink that spans three sides of the box. The top of the flap has a script word “Hannya” imprinted in the same gold ink with two Japanese characters. 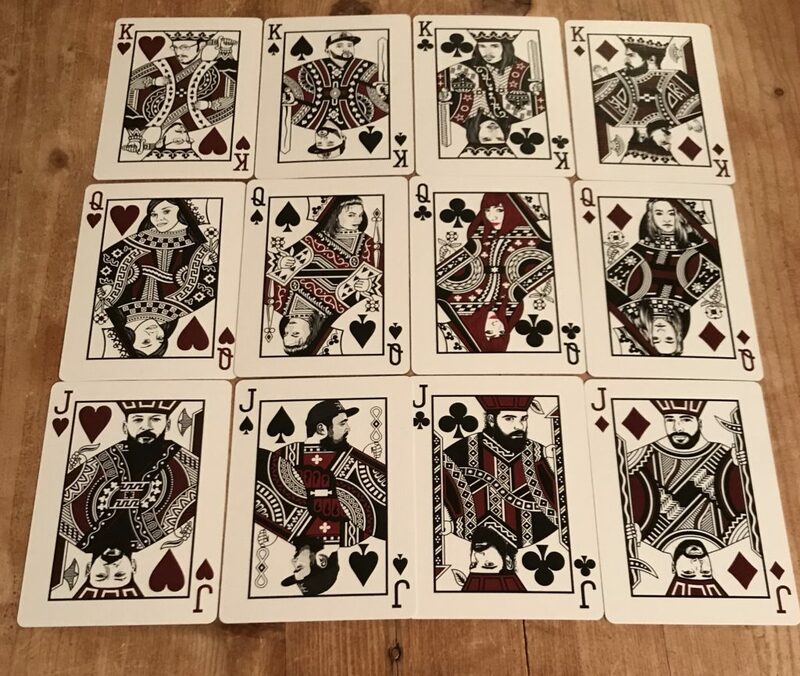 In addition to the 2 identical jokers that contain ink and tools to create tattoos, you get a blank faced card and one extra number card. The pips are standard font and design, although the red cards are printed with a less vibrant red ink, which is more like a brick red. The Ace that is not standard artwork is the Ace of Spades. This contains a large spade with tiny Hannya masks inside the spade and rays protruding from the giant black spade. “Hannya” is printed in script with the crediting text “BY DAMIEN O’BRIEN” printed underneath. The court cards contain custom artwork and pictures of O’Brien’s colleagues and friends as explained in the ad copy. I love the original artwork on the court cards which contains just a few basic colors: red, black, white and a touch of gray. The cards handle wonderfully and I found it very easy to faro. Cool concept, cool design, great cards. 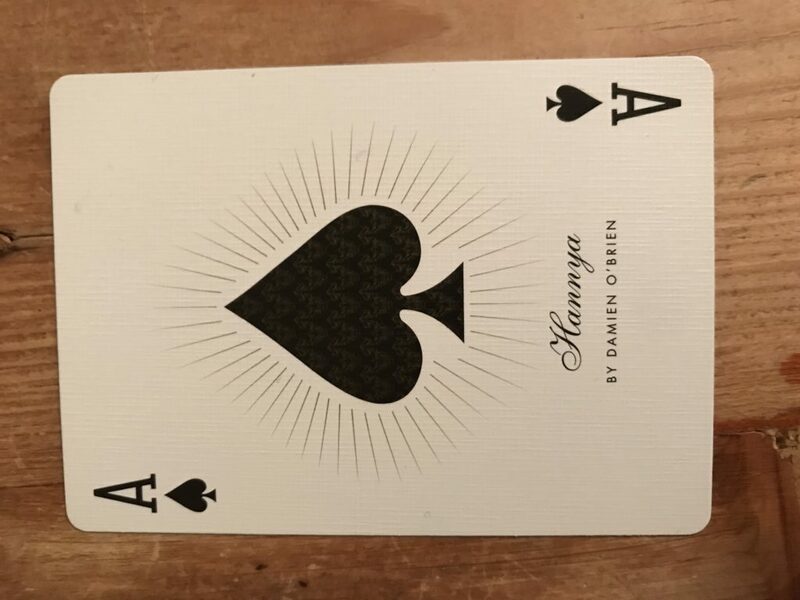 These cards can be picked up at any Murphy’s Magic dealer so long as they don’t sell out.